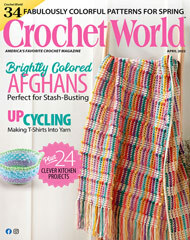 Looking for an easy crochet pattern that’s quick to stitch? Download this plush winter headband and matching neck warmer. Use finger crochet or an oversize crochet hook and get started. You’ll quickly stitch up beautiful textured accessories for the cold-er weather months. Customize the color to match your favorite outfit. Size: One size fits most. Made with super bulky (super chunky) weight yarn and size U/21mm hook.